Some say they’ll give you wings, others claim they’ll unleash the beast, but certain city officials claim they’re downright dangerous. San Francisco City Attorney Dennis Herrera is challenging claims that Monster Energy Drink has safe levels of caffeine for its customers. Herrera is requesting that Monster provide evidence that the product is as safe as the company claims. Herrera claims that hospitalizations from consuming the beverages have skyrocketed since the energy drink craze took hold over the last decade with at least five deaths linked to Monster beverages. He also claims the company uses extreme sports and music to specifically draw teenagers and young adults to its products. “We’re trying to make sure consumers are empowered and informed,” Song said. The Food and Drug Administration’s Center for Food Safety and Applied Nutrition released a report Nov. 16 that 145 serious health issues related to energy drinks were reported between Jan. 1, 2004 and Oct. 23, 2012. Twelve of the cases were fatal, and five were related to Monster. The company claims Herrera is singling it out due to “a lot of media attention this year,” according to Monster spokeswoman Judy Lin. Monster is in the midst of a lawsuit with the family of a 14-year-old who died in December 2011 from cardiac arrhythmia after consuming two 24-ounce Monster drinks within 24 hours. Mark Lewis, a broadcast and electronic communication arts major, drinks an energy beverage as a boost when studying or writing a paper. Although he finds the products effective, he admits to cutting down after he had some issues sleeping. “It helps, but I don’t like the way my heart is reacting when the rest of my body is exhausted,” Lewis, 24, said. He has been drinking energy drinks, including Monster, since age 16. According to the FDA, 80 percent of Americans consume caffeine daily, whether it’s coffee, soda or energy drinks. The average person should not consume more than 100-200 milligrams of caffeine per day. About two or four cups of brewed coffee equals 200-300 milligrams, according to Mayo Clinic. 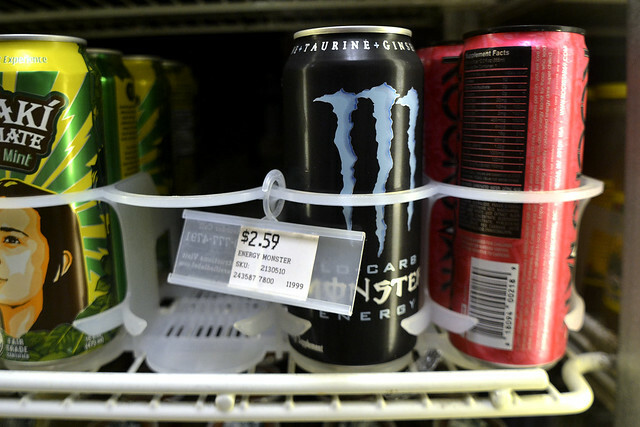 Teresa Leu, a registered dietician at the SF State’s Student Health Services, doesn’t recommend energy drinks and said individuals should avoid having more than 250 milligrams of caffeine per day. Individuals who are sensitive or have lower tolerance to caffeine may show signs of an overdose if they are experiencing heart palpitations, irritability and anxiousness at a lower dose. Monster beverages offer 10 milligrams of caffeine per ounce, and a variety of flavors and sizes from 8, 16 or 24 ounces. According to Herrera, who is working with other state attorneys and the Attorney General on the case, Monsters’ higher dosages of caffeine may result in serious health risks, such as increased heart rate, seizures and cardiac arrest, contrary to its advertisement. Though the company declined to comment on the recent lawsuit, Monster CEO Rodney Sacks released a statement Nov. 7 defending Monster Energy Drinks and saying that the drinks are legally within FDA guidelines and are safe when consumed responsibly. Sacks also argued other caffeinated products, such as a Starbucks coffee, contain similar amounts of caffeine, if not more than Monster products. Energy drinks like Monster classify the products as dietary supplements so they are given leeway by the FDA because they are relatively new products to the market, as long as the ingredients have been previously proven safe. If a product is deemed as dangerous, however, the administration removes the product off the market. “If someone is thinking about taking one of these products, they should consult with their health care provider to ensure that there are no underlying or undiagnosed medical conditions that could worsen as a result of using them,” Shelly Burgess, spokeswoman for the FDA, said. Leu said students should think twice before buying an energy drink because there are healthier alternatives. She recommends snacks high in protein and fiber such as Greek yogurt and fresh fruit.